Wednesday March 3rd 1920 Weather cloudy. I did some crotchet work. Cora took Hattie to town in afternoon to attend the funeral of Mrs Sanders who died in "Old Ladies Home." It rained in the evening. I took some checks and spent the evening at Otts. Thursday March 4th 1920 Did not get up till late. The girls both sewing today. I am knitting mittens for Edith Mason. Cora to store in the evening. I wrote to Lydia in the evening. Friday March 5th, 1920 A year today since Mary Wolf was buried and 19 since Bro Lee was laid away. It is frightfully cold now with snow on the ground. It was cold then.We had not been long at Coralville and I had such a bad cold. Hattie to Aid Society and Cora to town after supper. I was down at Otts after supper. We finished the income tax review. Saturday March 6th, 1920 I was down to Fannies part of the day. Had dinner there. Edwin Nixon went home with the mumps. The girls to P.E.O. meeting in afternoon. Letters from Lydia and Dorothy Crosby. Very cold. I knit on Edith's mittens. Hattie home in evening. 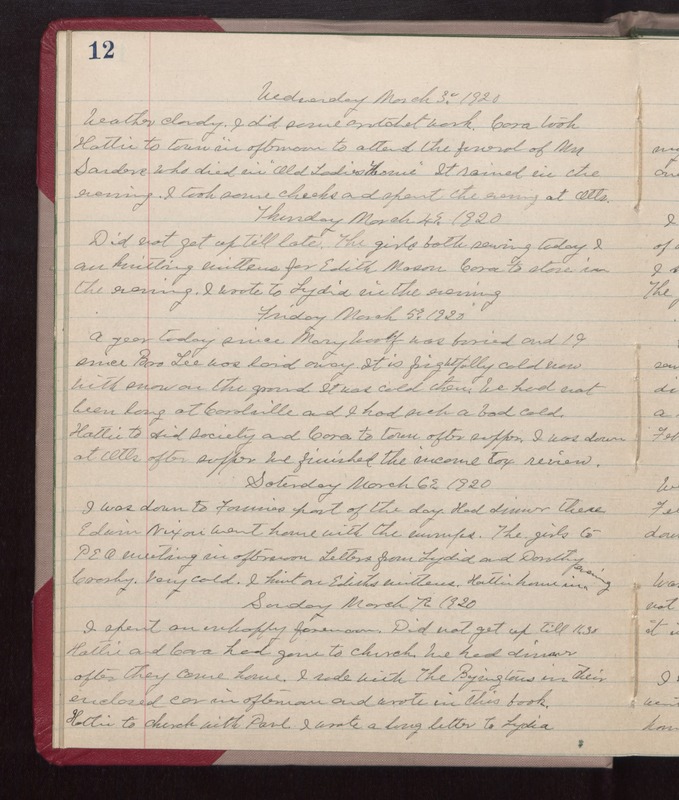 Sunday March 7th, 1920 I spent an unhappy forenoon. Did not get up till 11:30. Hattie and Cora had gone to church. We had dinner after they came home. I rode with the Byingtons in their enclosed car in afternoon and wrote in this book. Hattie to church with Paul. I wrote a long letter to Lydia.